Bac Kan (VNA) – As many as 100,000 trees will be planted during a tree planting programme that was launched at a ceremony held in the Na Tu historical relic site in Cam Giang commune, Bach Thong district of the northern mountainous province of Bac Kan on August 2. The activity was part of the “One million green trees for Vietnam fund” programme jointly launched by the Ministry of Natural Resources and Environment (MoNRE) and the Vietnam Dairy Products JSC (Vinamilk). Addressing the launching ceremony, MoNRE Deputy Minister Vo Tuan Nhan said that the “One million green trees for Vietnam fund” programme aims to raise public awareness of the significance of protecting the nature and ecosystems, and highlighting the vital role of the nature to life. Nhan called for the community to join hands in planting more trees in their residential areas, while actively plant and protect the forest, contributing to preserving the natural resources and environment as well as biodiversity, and building a living environment with the harmony between man and the nature. The 100,000 trees of various kinds with total value of 930 million VND will be planted in residential areas, memorial sites, relic sites, public places, schools, and areas affected by climate change. Ly Thai Hai, Chairman of the Bac Kan People’s Committee said that the province has the country’s largest forest area with the coverage rate at 72.1 percent. Over the past years, the province has shown strong performance in forest protection and development, ensuring the living environment, land and ecosystem, he noted, pledging that Bac Kan will plant the trees as schedule. 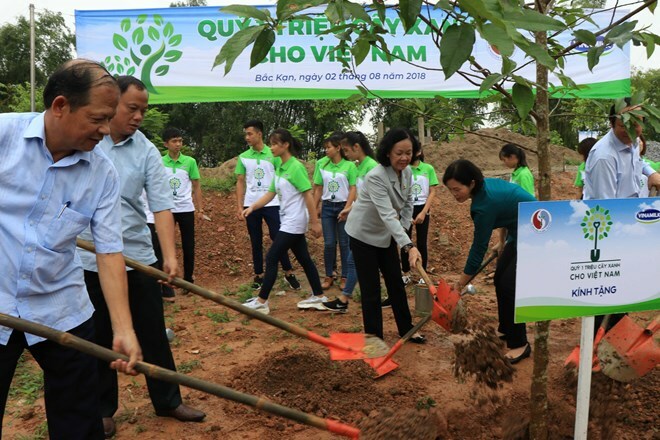 Through six years of launching, the “One million green trees for Vietnam fund” programme has planted 680,000 trees in 20 cities and provinces across Vietnam with total value of nearly 9 billion USD. In the coming time, the fund will continue coming to the rest localities with a hope of making the environment greener.